Why purchase bottled lemonade or mixes, when it’s so easy to make better-tasting homemade lemonade from fresh-squeezed lemons? The difference is night and day. This recipe makes fifteen 8-ounce glasses of fresh lemonade. You can adjust the sweetening to your own taste. For a zero-calorie drink, use non-caloric sweetener. For a low-glycemic drink, use agave nectar. You can also use this recipe to make fresh limeade. And varying the garnishes makes the recipe “new” each time. A shot of vodka or gin turns lemonade into a splendid cocktail. For Memorial Day, Independence Day or other patriotic occasion, add red and blue berries (red cherries, raspberries or strawberries, plus blueberries or blackberries). 1. Roll lemons on the counter before squeezing, to maximize the juice output. 2. 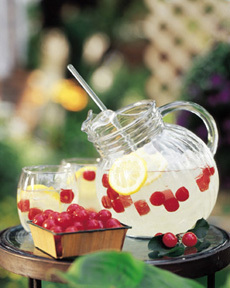 Combine water, juice and the three-quarters of the sweetener in a pitcher and mix thoroughly. Taste and adjust sweetness bit by bit. The objective is to keep the lemon flavor first and foremost and not make sugar the first thing you taste. It’s better to under-sweeten than over-sweeten: People can always add more sweetener to suit their individual taste. 3. Regular table sugar doesn’t dissolve easily in cold water. A better solution is superfine sugar or simple syrup (easy to make). 4. Add ice to glasses and fill with lemonade and garnish. Ideally, chill the lemonade prior to serving so it will be cold and require less ice (or no ice), which dilutes the flavor. You can also use one of our favorite tips: make lemonade ice cubes. 5. To garnish: Slice an extra lemon into wheels and cut notches so they sit on rim of glasses. You can also notch watermelon cubes. Or, fit a straw through the larger fruit such as watermelon and strawberries).